Big Poppa Eats: ChikaLicious "Lin-sanity"
Nestled on 10th Street between 1st and 2nd Avenue, ChikaLicious Dessert Bar has been serving serious desserts in a small, intimate setting to great success and acclaim. For those of us who love dessert but can't always take the time for a three course sit down the ChikaLicious folks have given us Dessert Club. Directly across 10th Street from the original spot, Dessert Club offers an array of delicious and unique desserts to eat in or take out. Good luck waiting until you get home to try them. Cupcakes? Of course. But forget those butter cream monstrosities everyone is peddling. Dessert Club's are light, airy and rich without feeling like you just ate a stick of butter stuffed with sugar. They are available in mini, regular and premium and in flavors like Caramel (amazing), S'mores, Triple Chocolate (as good as it sounds), Lychee, Red Velvet and Green Tea. Cakes, cookies, Macarons, ice cream and pastries are all on the menu. There is something for every sweet tooth. 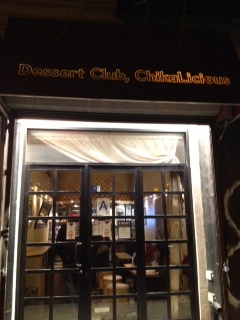 But none of the sweets at Dessert Club are standard fare. They are artfully crafted, elevated. For the folks at ChikaLicious, dessert is the main course, one that demands craft and style. They want to defy our expectations and remind us to never settle for the mediocre or average. 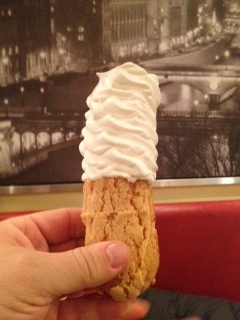 This is the Eclair Ice Cream Cone. NY Magazine called it one of the top ice cream treats in NYC. What is it? It is one of the best Vanilla Bean soft serve ice creams you will ever eat. But that wasn't good enough for the ChikaLicious folks. Instead of serving it in a cone, they take one of their eclair shells, fill it with soft serve then top it with a heap of soft serve. Yes, an eclair...filled with ice cream... used as a cone. It tastes even better than it sounds. (Please note that I took a big bite of this one before I remembered to take a picture). I am almost weeping as I write this. I want another one. Right now. High craft and passion. Delivering the goods. For all of us. 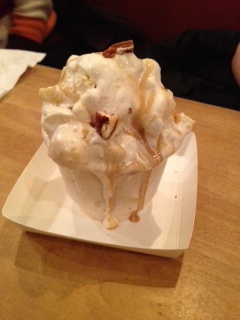 This is what Dessert Club is all about. (I am working hard to avoid a Fight Club reference here folks). So the next time you know you want something sweet but maybe you aren't sure what, or your crew cannot agree on the where to get dessert, Dessert Club has the answer. For you and everyone you know. Trust me. YUM! Makes me want to go there right now!